Heat oven to 425°F. 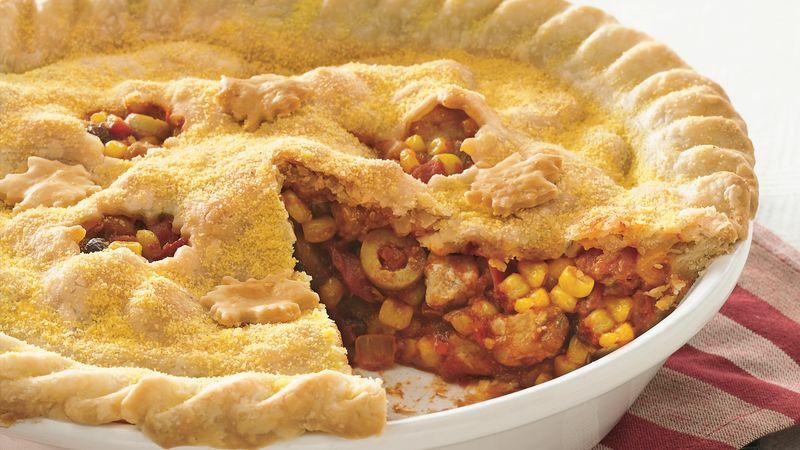 Make pie crusts as directed on box for Two-Crust Pie using 9 1/2- or 10-inch deep-dish glass pie plate. Spray 12-inch skillet with cooking spray; heat over medium-high heat until hot. Add pork and onion; cook 3 to 5 minutes, stirring occasionally, until pork is no longer pink. Add tomatoes, corn, green chiles, chili sauce, olives, raisins, cumin and salt. Heat to boiling. Reduce heat to medium; simmer 5 minutes, stirring occasionally, until slightly thickened. Remove from heat; cool 5 minutes. Spoon mixture into crust-lined pie plate. Cut 4 wide slits or small designs in second crust; place crust over pork mixture. Seal edge and flute edge. Brush crust with milk; sprinkle with cornmeal. Bake 25 to 35 minutes or until deep golden brown. Cover crust edge with 2- to 3-inch-wide strips of foil after 10 to 15 minutes of baking to prevent excessive browning. Let pie stand 5 to 10 minutes before serving. An ancient spice, cumin is the tiny dried fruit of a plant in the parsley family. Also called comino, cumin is very aromatic and has a pungent nutty flavor. To decorate the top crust of this savory pie, use small cookie or canapé cutters to cut little shapes in the crust. Brush the cutouts with a little water or milk, and press them lightly but securely to the top crust.